Working with formulas. Find out which operators can be used in which formulas and what each one does. +(Add) Calculates the sum of two values. -(Subtract) Calculates the difference of two values. ^(Exponentiation) Raises a number to a power of a specified number. and Close Parenthesis) Specifies that the expressions within the open parenthesis and close parenthesis are evaluated first. All other expressions are evaluated using standard operator precedence. = and == (Equal) Evaluates if two values are equivalent. The = and == operator are interchangeable. < > and != (Not Equal) Evaluates if two values are not equivalent. < (Less Than) Evaluates if a value is less than the value that follows this symbol. > (Greater Than) Evaluates if a value is greater than the value that follows this symbol. <= (Less Than or Equal) Evaluates if a value is less than or equal to the value that follows this symbol. >= (Greater Than or Equal) Evaluates if a value is greater than or equal to the value that follows this symbol. && (AND) Evaluates if two values or expressions are both true. Use this operator as an alternative to the logical function AND. || (OR) Evaluates if at least one of multiple values or expressions is true. Use this operator as an alternative to the logical function OR. DATE(Long timestamp, Boolean isGMT) converts timestamp(millisecond) to a Date, If isGMT=true returns a date in the GMT time zone. Else returns a date in the local time zone of the current user. If the time zone cannot be determined, GMT is used. DATETIME DATETIME(Long timestamp, Boolean isGMT) converts timestamp(millisecond) to a Datetime, If isGMT=true returns a datetime in the GMT time zone. Else returns a datetime in the local time zone of the current user. If the time zone cannot be determined, GMT is used. Active_Product = ?0?, ?1?, ?2? CASE (Active_Product, ??1? ?, true, NOTHING()) If Active_Product = 1, indicates the value ?true? ; otherwise does not display any value 0 = ?? 1 = ?true? 2 = ?? Pick list key = ?1?,?2?,?3? CASE(?A?, “1”,”B”, “2”,”C”, “3”, other) Converts the Foreign Keys from external picklists into Text for picklists in Salesforce. 1 = ?A? Pick list key = ?1?,?2?,?3? CASE(?A?, “1”,”B”, “2”,”C”, “3”,”D”,”4″, NOTHING()) Converts the Foreign Keys from external picklists into Text for picklists in Salesforce. 1 = ?A? Source_Nr = 512 VLOOKUP (Account, ID, Client_Nr__c, Source_Nr) Adds the Salesforce ID of the Account to the target field whose Client-Nr__c is consistent with the Source_Nr (512) Lookup Account ID = ?0012000000IL6xiAAD? Source_Email = ?user@skyvva.com? VLOOKUP (User, ID, email, Source_Email) Adds the Salesforce ID of the user into the target field whose email address is consistent with with the Source_Email (user@skyvva.com) Lookup User ID = ?0012000000IL6xiAAD? someone who wants to map the description field of an object. He gets a “;” as sign for a line break. Now he wants to replace the “;” with a break. What’s the best way to do this? DATE(“1292948797”, false) => result: 16.01.1970 in format (dd.MM.yyyy) in local time zone of current user. DATE(“1292948797”, true)=>15.01.1970 in GMT time zone. A contact (child) should have access to an account (parent). In order to assign a contact to an account, the account must exist in the system prior to the contact. For each customer / account (child), there is a designated account owner / user (parent). To import a list of customers, a key which explicitly identifies the Account Owner is required. Note: for each object, it is required to have an External Id field which is to be used for synchronization with external system. This external id field must be unique in order to avoid duplicate records on each object. Ticking Formula at a mapping record in the Data Mapping table. How can I put some logic in the mapped fields? If you select the mapped field and tick “Formula” and click again in the selected row, the formula screen appears. 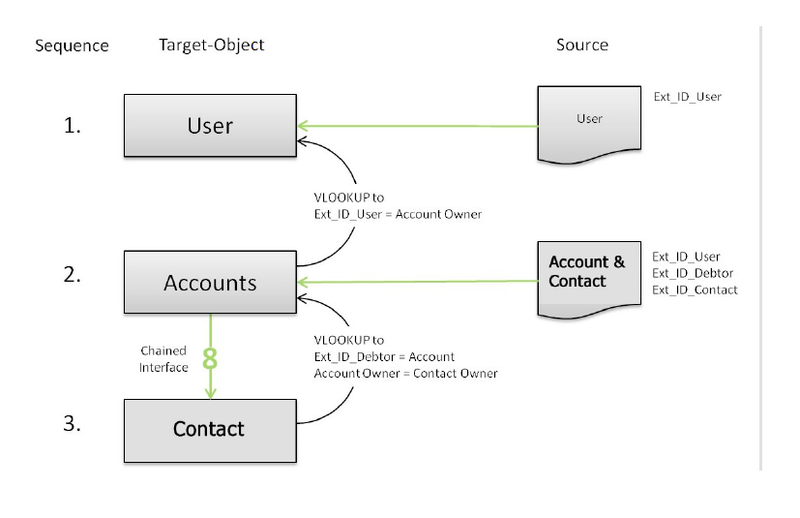 Below you will find a couple of examples of how VLOOKUP can be used with various objects in order to establish connections with other objects. Ensure that each object has a Primary Key (indicated with “*”), so that this object can be referenced. In the Standard Price Book, the price for each product is listed as the Sales Price. The Quantity and Discount are then applied and define the Total Price. This feature enables user extends function of mapping formula to execute their apex class. Sometime, standard formula cannot handle the complex business logic. So user can write the apex script to execute the business logic. public override String execute(Map<String,String> record): execute when processing mapping. User can define the formula based on data in map record and return their result as text (of Number, Date, DateTime, Id) is required by integration. public override void preExecute(List<Map<String,String>> records): execute before execute(…) and processing mapping, It is optional. But important in case execute query statement to search existing record in salesforce and cached result for using accordingly. Does not execute query in method execute(…) because it is called when processing mapping every message record data, It can exceed the query limit in salesforce. Please override the method preExecute(…) then query and cached the result for using in execute(…). Invoke apex class with formula APEXCLASS(“SkyvvaCustomFormula”): The apex class must be surrounded by double quotes. 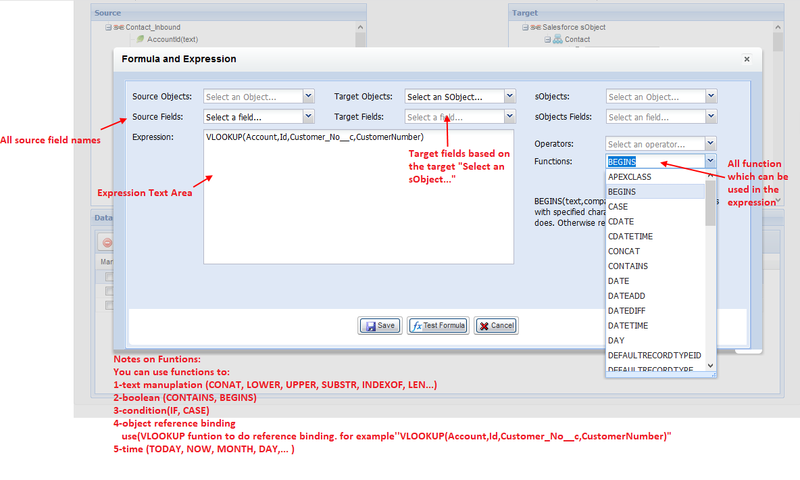 This apex query all accounts based on ERP_DEBTOR_ID number to get each account id to map to target field AccountId for contact. public override void preExecute(List<Map<String,String>> records): Queries all accounts in salesforce base on ERP_DEBTOR_ID’s values and caches result in Map. public override String execute(Map<String,String> record): Get account id from cached and return the id.